FreedomPop is one of the dozens of Mobile Virtual Networks Operators that operate in the USA (otherwise known as an MVNO for short). As an MVNO, the company does not have its own wireless network infrastructure, but rather it buys minutes, text and data at wholesale prices from major wireless networks such as Sprint that it can resell to you, the consumer. Usually the talk, text and data gets passed along to the consumer at a nice discount compared to what the parent network offers. (Disclosure: I was not paid or asked to do this review, however, when applicable, affiliate links are used within the post). 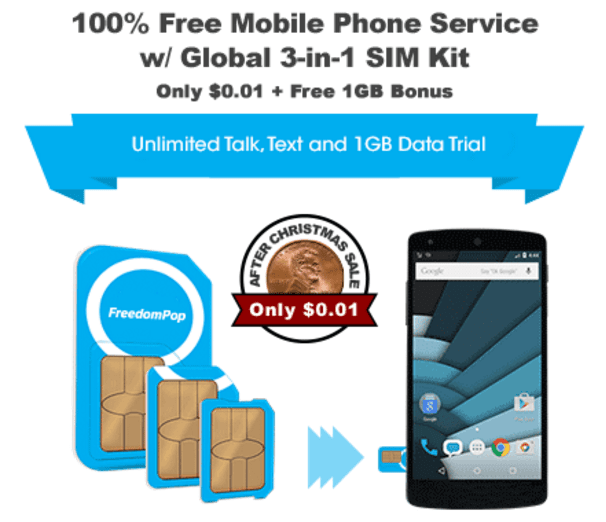 FreedomPop is an MVNO that definitely passes on big savings to the consumer as it manages to even offer several free phone plans including a domestic offering that features 500 text messages, 500 MB of data and 200 minutes to use every month. The purpose of this review however, will be to go over Freedompop's Global SIM offering and to let you know how it's associated cell phone plan worked out in the real world while traveling through the Northeastern USA, Italy, and Germany with a brief stopover in Paris France. The review was done with a partner, whom I purchased the Global SIM card for, and who went on the trip sans me. I was the one who unlocked the Cricket Samsung Galaxy S6 (via a quick call to Cricket) that was used for travel and with this FreedomPop plan. I had day to day contact with the traveler that included text messaging, phone calls and even video chatting throughout the trip. That last method of contact will provide a hint for some of you readers as to how the experience actually went. Read on to find out more! Before I get into the specifics of how the experience went, I will provide a brief overview of FreedomPop's cell phone plans and how the service works. FreedomPop's basic cell phone plans do not include calling over the cellular network, but rather it is done by VoIP, or in other words, over a data network. Some people get turned off by this, but I have yet to have any call quality issues while calling over a data network using services such as Google Voice, whether or not the experience was the same with FreedomPop, I'll get to that soon enough. Subscribers who are unhappy with FreedomPop's call quality via VoIP can upgrade their plan to one that includes what the MVNO calls "Premium Voice" for $3.99/month. Premium Voice gives you access to the underlying carriers traditional voice network. Those that need voicemail will have to pay an additional $2.49/month. Shop for FreedomPop's Global SIM plans. International calling is actually available with all FreedomPop plans free of charge but it is disabled by default, or at least that was the case with the Global SIM. FreedomPop subscribers get 100 minutes of free global calling to over 50 destinations, and simply need to enable the feature in their account to get it. Country specific calling plans are also available for those that need more minutes for a select location, and more calling plans are available for those that use more than 100 minutes a month calling multiple destinations. International texting is actually not supported by FreedomPop. Users on the global plan can however send text messages free of charge to friends and family back home in the USA, they just can't send text messages to international numbers that are outside of the USA. I purchased a FreedomPop Global SIM card from Amazon as the SIM card was sold out when trying to purchase directly from FreedomPop. A Samsung Galaxy S6 active on and from Cricket Wireless was the phone that was used during the review period. The phone was first unlocked by Cricket Wireless, before it was used with FreedomPop. Account activation was quick, but did not come without a hiccup. All appropriate information was inputted into FreedomPop's website to activate the SIM and service, however, I was greeted with a message and phone number stating that I'd need to call FreedomPop to get it working. A call was made to FreedomPop and everything got resolved within 5 minutes of calling the MVNO. During the call FreedomPop issued us a free trial of premium voice calling for domestic use as well as 2 GB of data that could be used globally. Score! Without the free trial, the cost at that time to get those extra services would had been $20/month. A phone number was not ported into FreedomPop as that number was kept active with Cricket Wireless. The traveler only wanted to have service with FreedomPop while they were out of the country. Upon activation it was noted that Google Voice/Hangouts stopped working. We were greeted with a message stating that in order to place a call money had to be deposited into the Google Voice account. Google seemed to think that the phone was being used in Europe. In fact, even with airplane mode turned and only Wi-Fi active, it still thought the phone was in Europe. The reason for this is because FreedomPop routes it's traffic on the Global SIM plan through Fogg Mobile, which is a company based out of Europe that provides global data access to FreedomPop. My tester left the local airport and had a layover at JFK in NYC. We exchanged a few text messages including MMS (picture messages) at that point without issue. The only complaint is that the pictures that got sent were being compressed quite a bit. In fact, the maximum resolution of any picture received throughout the entire trip was 0.2 MP! Of course, the number of megapixels does not tell the whole story, the maximum picture size received was 390 kilobytes. This meant, as long as you didn't zoom in at all the pictures looked just ok. As soon as I zoomed in on one, it quickly would begin to pixelate and show a lack of real detail. By contrast, I normally receive MMS picture messages from that phone that are up to 0.98 MB in size with a resolution of 5 MP when it is active on Cricket Wireless. Photo taken at a vineyard in Florence, Italy shows big loss in resolution when sent by MMS using FreedomPop's messaging app. Photo was uploaded to the web as is, downloaded from my MMS messaging app without any additional compression added. The flight from JFK did not fly directly to Italy, but rather had a layover in Paris, France. I was able to stay in contact with the tester during the layover via text messaging without a hiccup. Pizza anyone? Photo taken and sent by MMS while testing out FreedomPop's global plan in Florence, Italy. From Paris, the tester connected with a flight that went to a final destination of Florence, Italy. It was here that we really got a true view of how the service was going to work as the vacationer stayed in this area for 6 days. Text messaging continued to work right out of the gate upon arrival, however after moving in and around the city, it was noted that service kept dropping out. At one point there was actually a loss of service for several hours. We'll get back to this. I tried calling the person at one point, and they were unable to receive a call from me, even when connected to Wi-Fi. The person could not call out either. At that point I suggested uninstalling and reinstalling the FreedomPop app, and that resolved the issue for incoming calls. I was able to call the person and we spoke for a few minutes without issue. I then had the person disconnect from Wi-Fi so that I could call them back. Again we spoke without issue, and call quality was pretty good. The FreedomPop app needed to use the service still has settings in it to adjust call quality, but we found no reason to change from the default. When the person tried an outgoing call to me for the first few times it also failed. It was determined that in order to place an outbound call, the symbol + had to be dialed as well as country code 1 before putting in an area code. Dialing the + symbol is generally required to place calls from one country to another, but neither of us had ever placed a call from a foreign country back to the USA before, so we were not aware of this necessity. What was also interesting to note here, is that you can now place outgoing calls using your phones native dialer with FreedomPop, which was not the case when I last tested the service over 2 years ago. At that time you had to use FreedomPop's dialer that came with the FreedomPop messaging app for all phone calls. A video chat was also attempted using Google Hangouts while walking through the city on the third day. Video quality ranged from pretty good, to pretty poor and blocky, although it did at least work and was interesting to see things live from across the ocean. Attached is a screenshot of what the poor quality looked like. Unfortunately I cannot upload a picture of what the good quality looked like as the only screenshots I have are that of the the testers face. Again it was noted that as the tester moved through various locations throughout the city the service would sometimes drop out for hours at a time. After a little research and some troubleshooting I asked the tester to toggle airplane mode on and off the next time it happened. Toggling airplane mode on and off ended up working to restore service. In fact it worked every time there was an issue for the remainder of the trip. An estimated 424 MB of data was consumed during this portion of the trip. For the next part of the trip, the tester traveled to Bremerhaven, Germany and stayed there for a period of 5 days. During the trip, there were daytime excursions made to other parts of Germany including to Bremen, and to the Lower Saxony region of Northern Germany. By this portion of the trip we had all the issues figured out from the experience in Florence, Italy, so there were no real issues in Germany. Everything worked essentially the same as it did in Florence. Anytime service dropped, a toggle on and off of airplane mode resolved it. We were able to send text messages and MMS at will for the duration of the trip. A phone call was actually not made during this portion of travel, although I would expect there to be no issues given the data speeds that were obtained during the trip. The tester was out running speed tests nearly every day, sometimes several a day while moving around and about through Germany. Just 83 MB of data was consumed during this last portion of trip. Our experience with FreedomPop's Global SIM plan was great. We really couldn't complain about much of anything given that to use the service it cost a total of $10, which was the cost of the SIM card. By contrast, AT&T and Verizon both charge upwards of $10/day to use your phone globally! Interested in seeing what FreedomPop has to offer you, shop FreedomPop now! When using freedompop in the USA, users are retired to use an app to make and receive phone calls and texts. This way of completing calls or texts will use your home Wi-Fi or it will use your cellular data allotment. I would rather use the phone’s traditional phone dialer and the phone’s text message icon. Have you tested any European prepaid SIM cards? I’m thinking about buying one to use in my unlocked iPhone on a trip to Europe. I’ve seen them on Amazon at a range of prices, depending on how much data, voice, etc. is pre-loaded. For example, ~$30 for 3000 minutes, 3000 messages, and 12GB of data. Seems like a great deal! No I have not. But I have heard that prices outside the USA tend to be much cheaper. Tried their 99c “free” deal and went very bad. Their deceptive practices are full of ways to charge you and very user unfriendly-to say the least. Avoid at all cost!! Next PostNext RingPlus Resurrected As Or Involved With SpeedTalk Mobile?